In the world of tea, Mrs Ming is very unusual. There are very few woman in charge of a tea plantation. 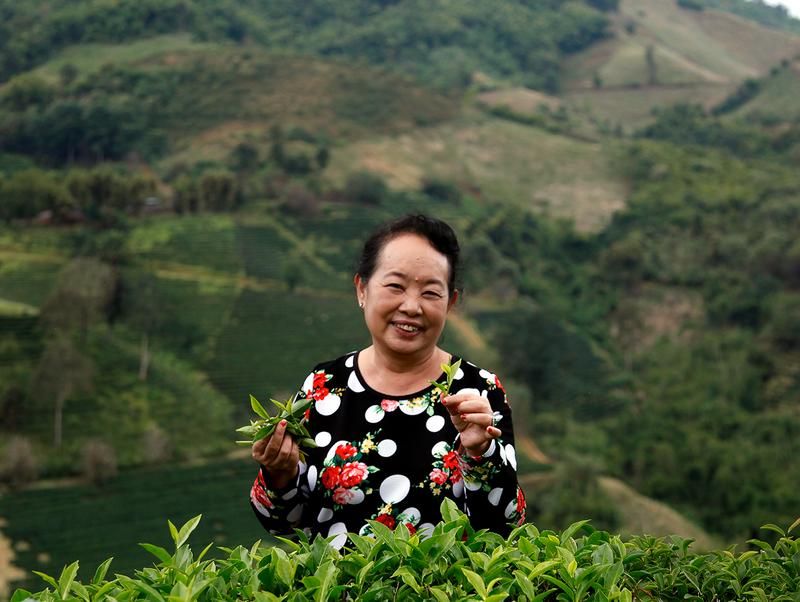 Not only does Mrs Ming produce some incredible Oolongs, she is also a pioneer, because she introduced tea to the area around Mae Salong. Since then, producing lightly oxidised teas in the Taiwanese style has become fashionable in this area of the Golden Triangle, on the border between Thailand and Myanmar. I met Mrs Ming nearly ten years ago thanks to Augustin, one of my nephews who was travelling through these remote mountains on his motorbike. I’d asked him to let me know if he came across any tea plants. Mrs Ming reserves her best teas for me – Jade Oolong, Ruby Oolong, Milky Oolong, Thai Beauty – along with that type of friendship that lasts a lifetime. Daring and exacting, Mrs Ming never rests on her laurels. She experiments, innovates and tries out black and dark teas, with success. I have already chosen some, and soon you’ll be able to try them too. For the tea connoisseur, the “Golden Triangle” is a unique region. First, it is without doubt where tea was born, and that already counts for something. And these days, on those steep, inaccessible mountain slopes, there are as many different teas as there are ethnic groups. 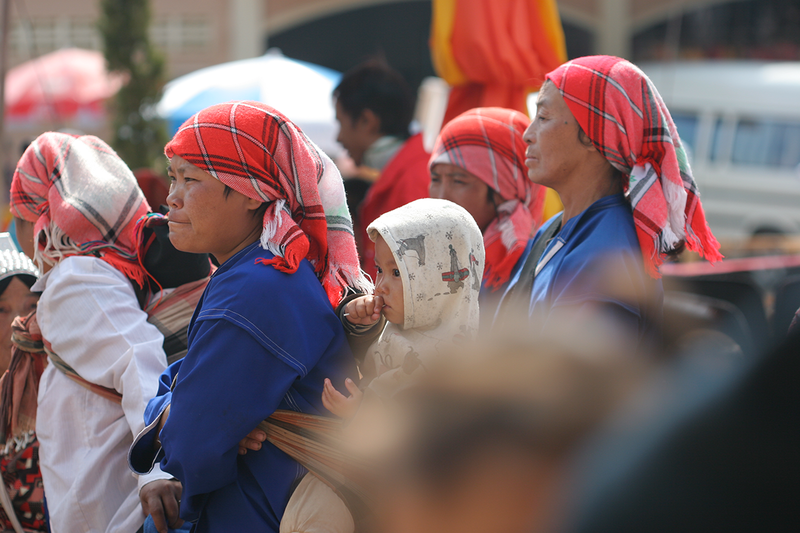 From southern Yunnan to eastern Myanmar, via northern Laos, Thailand and Vietnam, one encounters a great variety of traditional costumes and customs. People in this region produce white, black, green, blue-green or dark tea, depending on local tastes. Some are worthy of the name “premium” tea. And there are still many farms waiting to be discovered in these endless mountains shrouded in mist and legend. It’s a real treasure trove for a tea researcher seeking out new gems! Sri Lanka is a magnificent country, now at peace. 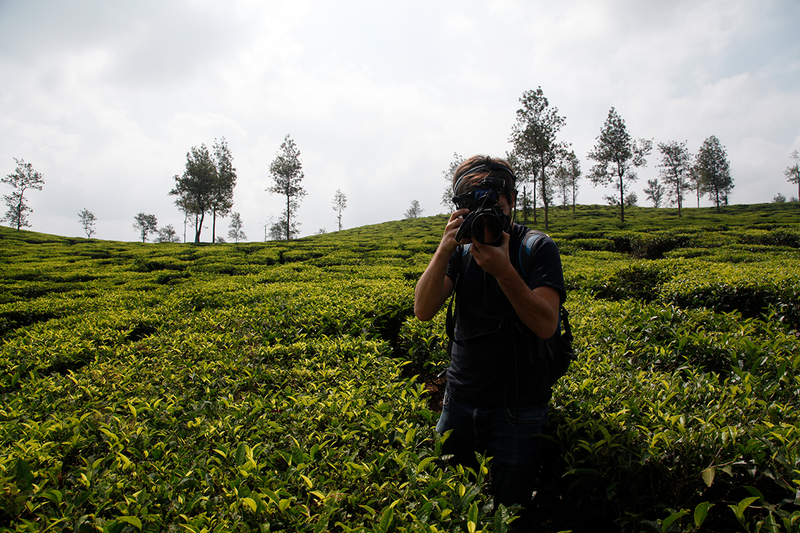 The landscapes are stunning, with tea plants as far as the eye can see. 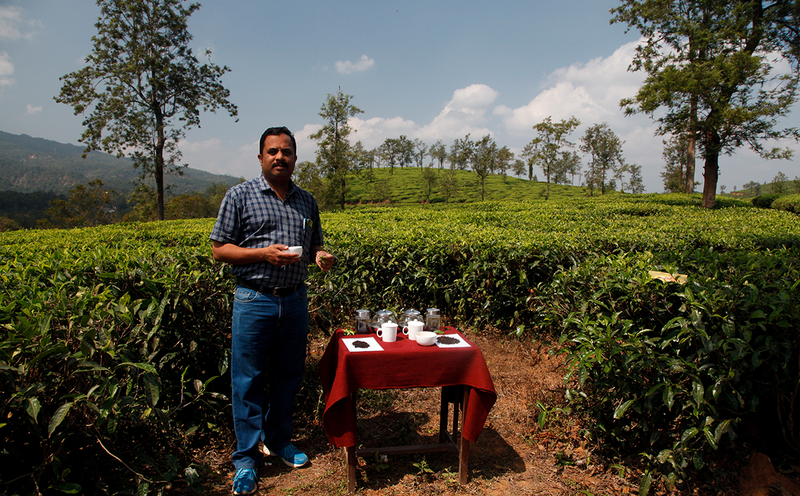 The country’s best teas are produced in the south, near the remarkable Sinharaja forest – these are the low growns. Further north, the teas are manufactured more industrially, a legacy from the colonial days. On these high northern plateaus, producers could make better teas if they stopped using machines called rotorvanes, which maul the leaves to accelerate the oxidation process. It would also be better, in this region where the climate and scenery remind Scottish visitors of their own country, to come across more people who own their land and make their own tea, rather than employees – often women – working in less than ideal conditions. A fair system works very well for the low growns (for example at New Vithanakande, the most famous garden in that region). 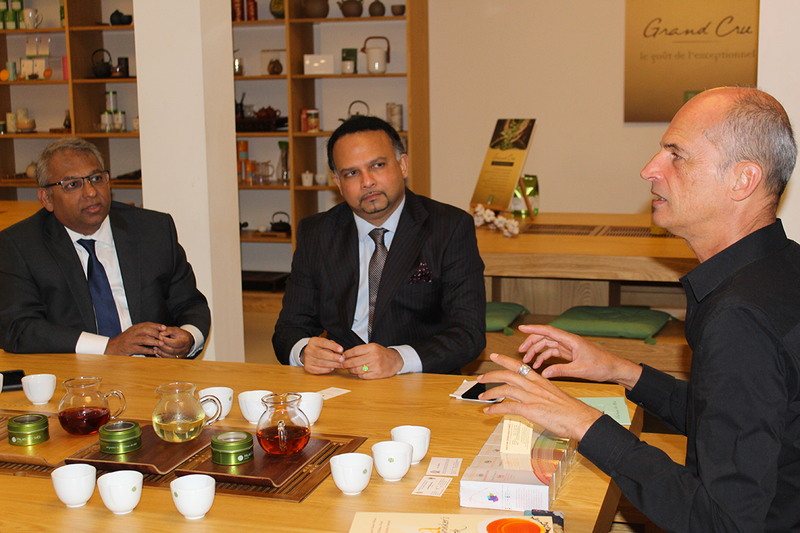 During the visit to France by Navin Dissanayake, Sri Lanka’s minister for the tea industry, accompanied by Buddhi K. Athauda, the Sri Lankan ambassador to France, we enjoyed an informal tasting and friendly discussion at their request to help them understand how to make what used to be known as Ceylon teas – Sri Lankan teas – better known in France. To create the ideal tasting conditions, you need quality tea, you have to pay attention to the quality and the temperature of the water, the brewing time and, of course, the recipient. Avoid large teapots, because they are detrimental to the quality of infusion. To get the very best out of your tea, including and above all the rarest teas of all, the material and the size of the recipient are essential. Here is an inspirational tasting session for the famous designer, Patrick Norguet. His goal is to understand my trade, to understand the imperatives and the expectations, so that, one day, he can create the ideal object for tasting tea. I am looking forward to it. 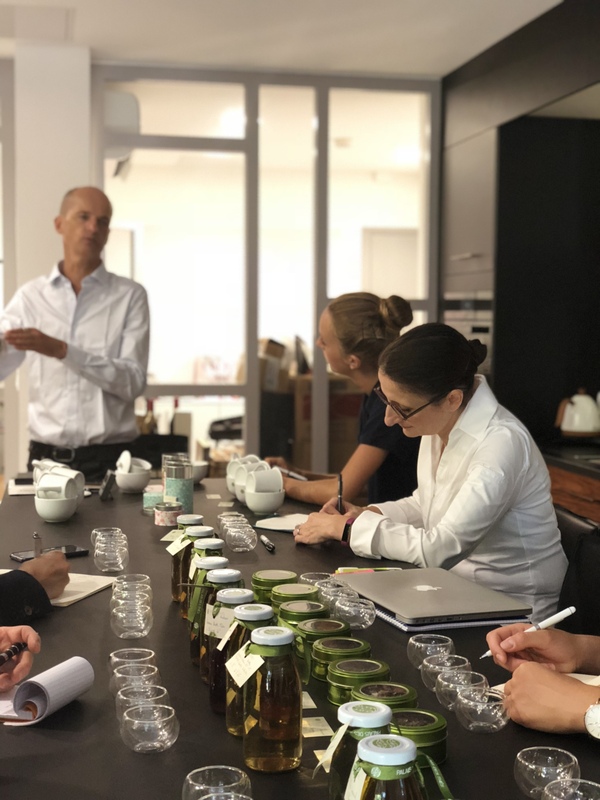 This week I had the immense pleasure of tasting a fine selection of premium teas with Anne-Sophie Pic and her team of sommeliers. Anne-Sophie is such a kind and considerate person and treated me like royalty in Valence. She is eager to learn and so generous with her time, especially considering she’s the only French woman to hold three Michelin stars. She listens attentively and asks plenty of questions. Together, we tasted teas infused, both hot and cold. 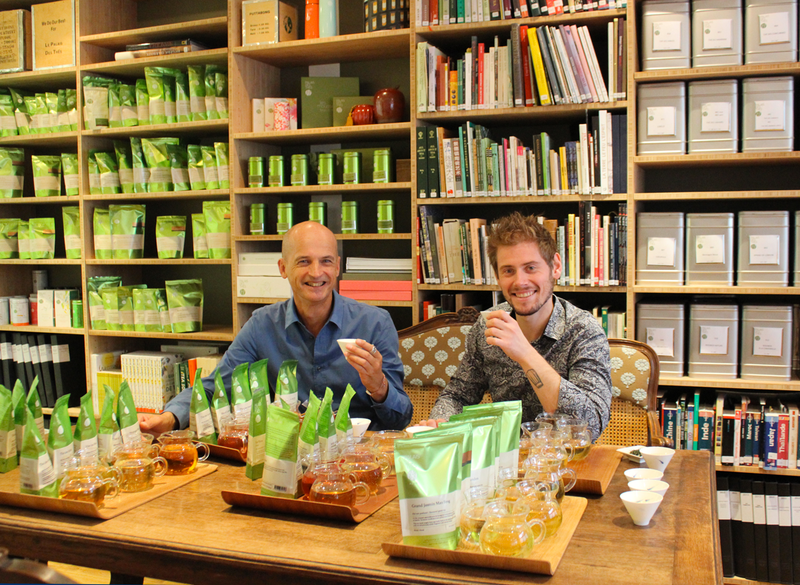 Our tastings took us to Darjeeling and Japan via Nepal, South Korea, Viêt Nam and even Africa. We talked about ways to use tea in cooking, and possible pairings between teas and dishes. It was incredible to contribute, however modestly, to her inspiration! And what a treat to share an unforgettable meal with her afterwards, an explosion of textures, flavours and aromas. Thank you Anne-Sophie. 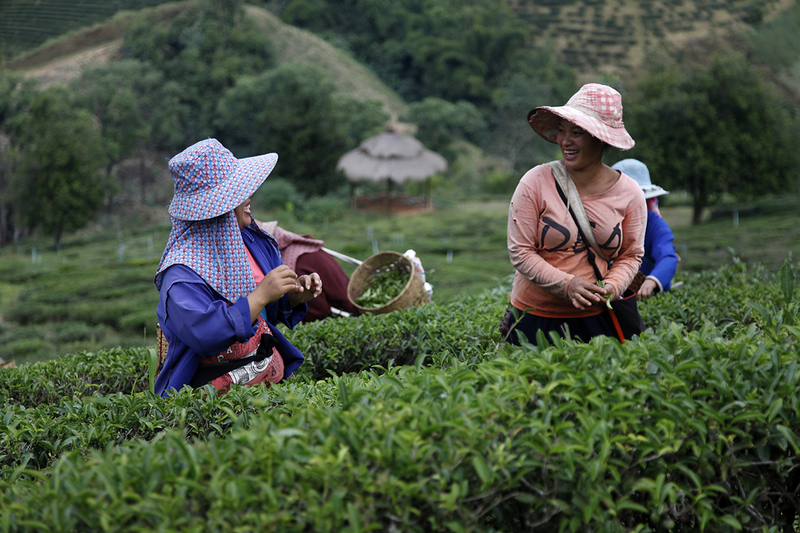 Some teas are produced on a vast estate with up to a thousand people living on it. Some are produced by a co-operative of small producers. And some are produced on a simple farm, like here, at Pathivara. Different farms have different social structures, and I prefer the ones on a human scale. A far cry from the cliché of the planter living cut off from the world in a magnificent bungalow (inherited from the days of British rule), when tea is produced on a farm, villagers often spend the evening there too. They sit around together, chatting, chatting, chatting. Sometimes they drink, sometimes they play music, sometimes they dance. It’s life, quite simply.